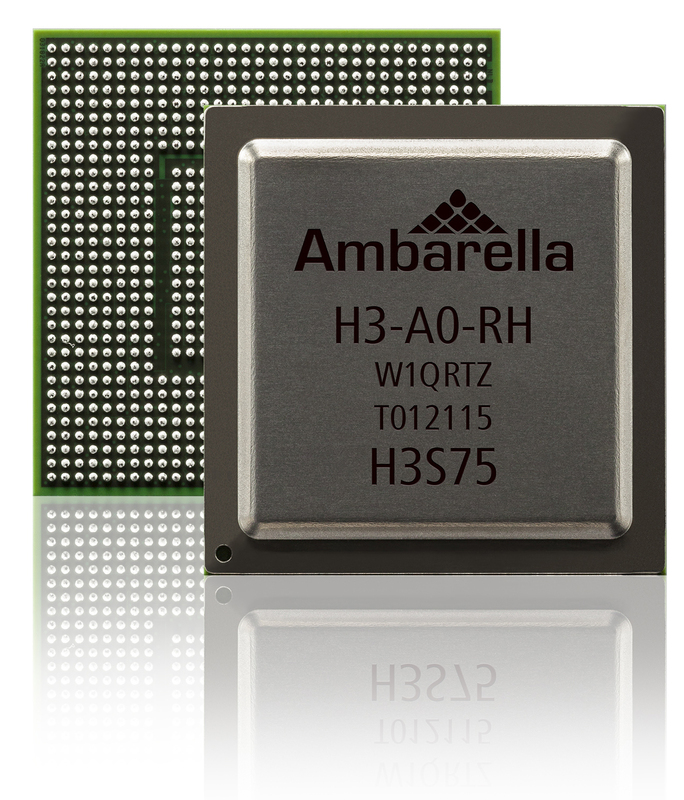 Ambarella introduces the H3 SoC for high-end drones and a new generation of video cameras, including 360-degree and virtual reality cameras. The H3 video SoC enables 8K Ultra HD (33 MP per frame) H.264/AVC video at 30 fps, as well as multiple video streams with equivalent performance, including 360-degree cameras with dual 4KP60 sensor video capture. H3 includes a powerful multi-channel ISP for 360 degree video capture and multi-sensor drone applications. Its 10-bit HEVC HDR video processing handles high contrast and wide color range scenes. It also features Ambarella’s EIS, capable of generating a smooth 4Kp60 video output under challenging conditions, including during high winds and with high degrees of rotation. The integration of a quad-core ARM Cortex-A53 CPU with floating point and NEON provides significant processing power for customer applications including computer vision, wireless networking, and multi-sensor stitching algorithms. The H3’s hardware de-warping engine supports wide-angle panoramic camera designs and fish-eye lenses. Ambarella also introduces the H22 SoC targeting 4K drones and sports cameras with video features. The H22 SoC is capable of encoding 4K video at 60 fps using the H.265 (HEVC) or H.264 (AVC) video formats, and supports advanced EIS up to 4K resolution. Ambarella also introduces its AEC-Q100 qualified A9AQ family of automotive SoCs. The Ambarella A9AQ is a 4K Ultra HD single-chip solution for single or multi-camera electronic mirror, surround view, and video recording systems. The Ambarella A9AQ provides a single-chip solution for three camera side-view and rear-view electronic mirror systems. Its multi-exposure HDR processing provides superior visibility even in low light or high contrast scenes. LED flicker mitigation dramatically reduces artifacts introduced by LED headlights and traffic signs. Ambarella has a poor record of feature implementations and support for their A7 and A12.